This Fall Harvest Salad is chock full of well, all things fall. Mustard, bacon and bleu cheese brings the savory while maple, apple and candied walnuts add some sweetness. It’s the perfect salad to healthfully welcome the cooler weather of fall. When the temps drop do you get excited for all the warm, hearty foods of winter that are within reach? Chili, soups and mashed potatoes are my favorite cool weather foods that I usually start to crave right about now. But we’re still having warmer weather around here for this time of year so it just hasn’t hit me yet. But I am starting to crave some fall flavors so in comes this delicious, beautifully composed salad. 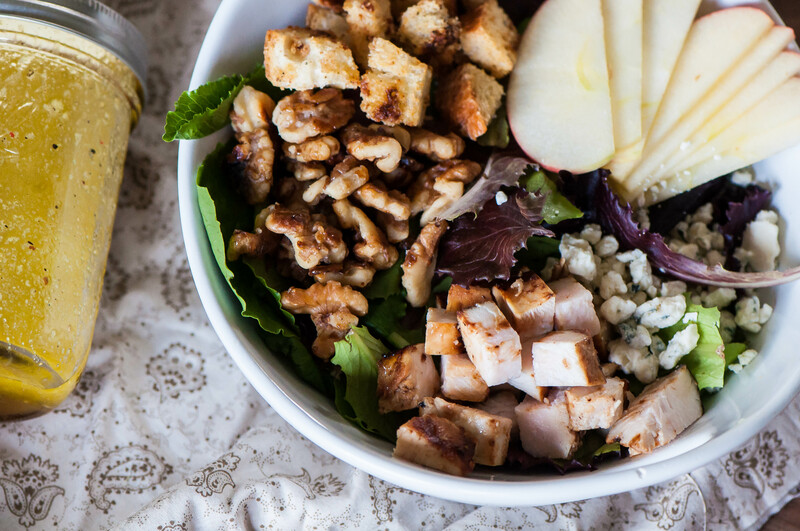 This Fall Harvest Salad has everything – mixed baby greens, honeycrisp apples, lightly candied walnuts, bleu cheese, maple Dijon chicken, Dijon bacon croutons and maple vinaigrette. Doesn’t that combo just scream fall to you? It may sound like a lot but it’s all super easy and all of the components except for the apples can be prepared ahead of time so all you have to do is throw it together when you are ready to eat. And let me tell you, every single ingredient is important and adds a delicious level of flavor so don’t get any ideas about skipping something. If bleu cheese isn’t your thing, gorgonzola, feta or goat cheese would be great substitutes. The maple syrup in the dressing and the apples bring a yummy sweetness to the salad as well as those coveted fall flavors. The mustard and bleu cheese add a strong, sharpness to the salad to balance the sweet ingredients. For me, a salad just has to have a crunch and this version gets a double dose with candied walnuts and Dijon bacon croutons. For the chicken: whisk together the Dijon mustard, maple syrup, garlic, worcestershire, vinegar, salt and pepper. Place chicken into a ziptop bag and pour marinade into the bag. Seal and smoosh around until chicken is coated. Marinate in the fridge for 1 to 4 hours. Once marinated, preheat grill to medium-high heat (400 degrees). Cook chicken for 6 minutes on both sides or until cooked through and no longer pink. If your chicken is thinly sliced, cook less time. Remove from the grill and allow to rest for 5 minutes. Slice into bite size pieces. For the candied walnuts: combine all ingredients in a skillet over medium heat. Stir often for 5 minutes then pour onto parchment paper or foil and spread into a single layer. Allow to cool. Place baby greens into a large bowl. Top with apple slices, bleu cheese, chopped chicken and candied walnuts. Toss lightly then drizzle around the bowl with desired amount of dressing. Toss again, top with croutons then serve.